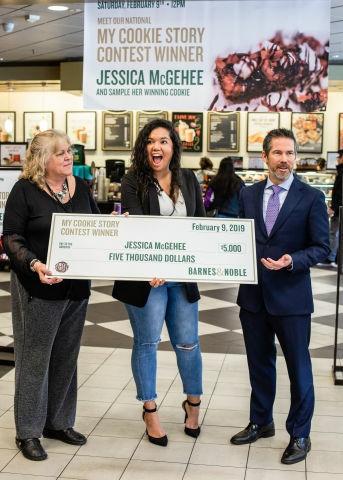 Barnes & Noble My Cookie Story Contest winner Jessica McGehee receives her $5,000 check from Neil Strong, VP of Cafe Operations for Barnes & Noble, and Kathy Ennesser, Store Manager of Barnes & Noble in Chula Vista. Credit: Paige Powell, Creative Paige Photography. Barnes & Noble, Inc. (NYSE: BKS) is the nation’s largest retail bookseller, and a leading retailer of content, digital media and educational products. The Company operates 630 Barnes & Noble bookstores in 50 states, and one of the Web’s premier e-commerce sites, BN.com (http://www.bn.com/). The Nook Digital business offers a lineup of popular NOOK® tablets and eReaders and an expansive collection of digital reading and entertainment content through the NOOK Store®. The NOOK Store (http://www.nook.com/) features digital books, periodicals and comics, and offers the ability to enjoy content across a wide array of popular devices through Free NOOK Reading Apps™ available for Android™, iOS® and Windows®. General information on Barnes & Noble, Inc. can be obtained by visiting the Company's corporate website at http://www.barnesandnobleinc.com/. For more information on Barnes & Noble, follow us on Twitter, Instagram, Pinterest, Snapchat (bnsnaps) and Facebook. For more information on NOOK, follow us on Twitter and like us on Facebook. Sweet Street is the leading innovator in the dessert industry. The Company is owned and operated by Sandy Solmon and headquartered in Reading, Pennsylvania, where Sandy is also the head of research and development, leading a team of like-minded, passionate researchers and recipe developers who now bake for restaurants in over 60 countries, on every continent. Visit them at: https://www.sweetstreet.com/. More news and information about Barnes & Noble, Inc.